The interminable howling tradewinds abated for a brief weekend of lovely weather. 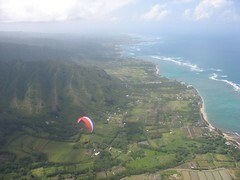 Over twenty of Oahu's finest pilots flew in nice light conditions at Kahana over the course of both days. 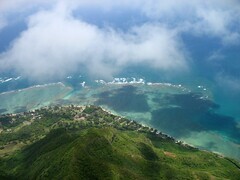 Five fantastic cross country trips originated there (including Russell's first trip to Kualoa - hooray!). We all enjoyed hours of heroic hiking, loads of launches and landings, scads of stellar scratching, and several super spirals (and possibly other more exotic maneuvers). Ray took a bunch of nice pictures on our cross country flight on Saturday. It was fun flying alongside him in my newly repaired M4 - Ray's new comp wing is a great performer, but I have a little better chance to keep up with him on my new wing, compared to how he had been stomping me the last few weeks while I was flying my old clunker. At Makapuu on Sunday, the gale force gurus got an unsuspecting visitor in over his head - or at least over the back, and Quentin followed him over in his brand new M4 to lend moral support. Dave said that when Juan first saw the launch at Crazies, without even knowing what we call the place, his first comment was: CRAZY. Dave assumed he meant the launch, but I suspect he meant to describe the pilots that use it. Welcome to the loony bin! Hip-hip HOORAY for Russel! Way to show em how it's done!